"Steve Campbell is a superb craftsman, ideally suited to maintain the historic tradition of high quality F.E. Thomas Bamboo fly rods." The Thomas Rod Company has the perfect split bamboo fishing rod to meet every requirement of today's fisherman. Every Thomas Rod is handmade and is fully guaranteed. All Thomas Rods come with a three day inspection privilege and a guarantee on materials and workmanship for the life of the original owner. We go to great lengths to make sure the quality you have come to expect from a Thomas rod is maintained in every new Thomas rod. The Thomas Browntone has a beautiful and unique finish, from which the rod derives its name. This finish, will not fade, and adds to the resiliency of the bamboo itself. Thomas Browntone are available in lengths from 6' 10" to 9', and line weights from 3 to 8 weight. 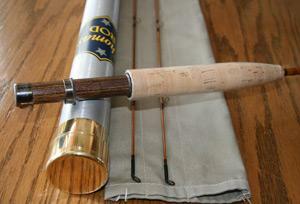 All rods are individually serial numbered, and come with two matching tips, cloth bag, and brass capped aluminum case. *Prices are for 2 piece models, and include shipping and insurance to the buyer. Maine residents add 5% sales tax. **3 piece rods available for an additional $200.00. The Thomas Special rods have made history in the field of fly fishing, and upon them our reputation has been founded. Its construction is identical with that of our Browntone rod, the difference being found in the finish of rod and mountings. Thomas Special rods are available in lengths from 6' 10" to 9', and line weights from 3 to 8 weight. A deposit of 20% is required to place an order. Check/Money Order or PayPal is accepted. A delivery date will be set when your order is placed. Currently, our wait period is 8 months. All Thomas rods have a 3 day inspection privilege at delivery to ensure 100% satisfaction. Trades of Vintage rods, reels, and high quality guitars are considered on a case by case basis. Please contact us to discuss a trade.